I know you’re busy – cut to the chase in the video above at 1:10..
Hurricane Sandy is being described as the “worst storm in 100 years” and will possibly mutate to super-storm status once it combines with a polar air mass over the eastern United States enabling it to cause widespread damage and chaos, but how convenient is the timing of this “natural” event in regards to the election? 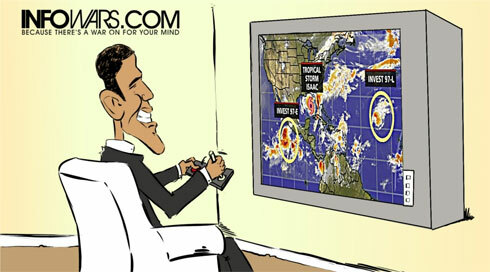 Is it possible that the storm is a contrived event designed to throw the election for Obama? So the question is: Is this a geoengineering October surprise? That’s not really true Jean. Obama passed new fuel efficiency standards to double vehicle mileage, and his EPA has begun to regulate GHG emissions from power plants, for starters. He seems to be a politician first and a supporter of climate change action second, for sure. Still, considering the behind-the-scenes energy policy measures he has approved, he may be much more vocal if elected to a second term. We can only hope, at least, that he pulls out all the stops if elected to a second term. While he’s done less than I think he should, he’s done more than Romney ever will. I don’t think anyone is going to be able to top NevenA’s response. Too true. dana1981 – I’m skeptical about the fuel efficiency law. If a doubling was so technologically possible, we’d see greater strides on that front than we’ve seen the past few years. Beyond that, the law is drafted so that it can easily be weakened or dropped altogether, and it has little impact on the industry for several years. It sounds good, sure, but time will tell. On the EPA and GHG, this is partially true. It is applies to the building of new plants – not existing plants. I’m also skeptical of this – it can easily be overturned, and it faces threats from not just Republicans but simple economics. Some industry insiders believe it will inevitably lead to rolling brownouts, and as of now it’s completely reliant on the natural gas industry (which I think has a temporary mirage of abundance). The only way to really keep it going is a rapid increase in renewables (or nuclear) – and so far this isn’t proceeding like it needs to do. But you’re correct that Obama has done something. It’s just not much. And BlueTec / BlueMotion engines combat the higher amounts of NOx that diesels create. Amazing!! Mr. Knight manages to say all that with a straight face!